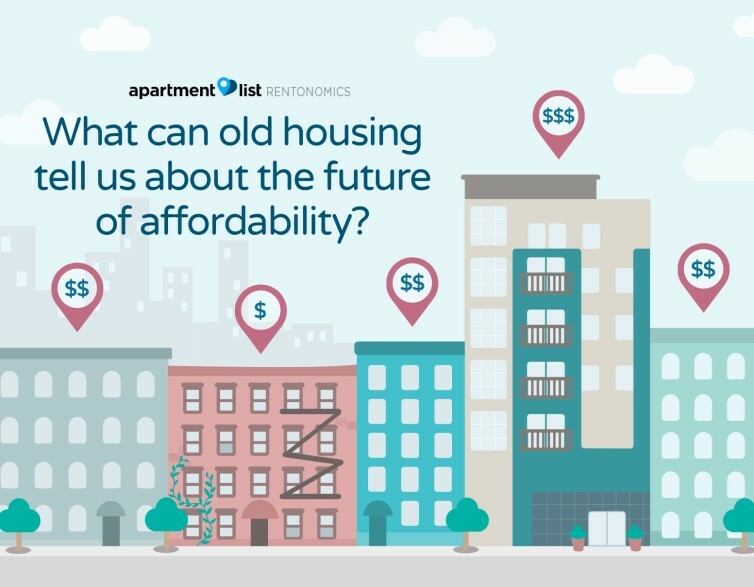 What Can Old Housing Tell Us About the Future of Affordability? Since 1980, the share of rental units that are less than 10 years old has fallen from 24 percent to 9 percent. 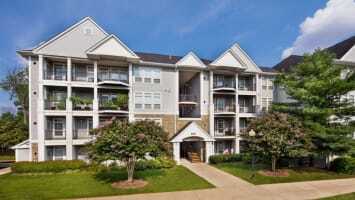 Over the same period, the share of rental units over thirty years old grew from 41 percent to 66 percent. With older buildings making up an increasing share of the housing stock, particularly in Sun Belt cities, the fate of these properties has important implications for affordability. In a healthy market, buildings become less desirable as they age, and older units serve as an important source of market rate affordable housing through a process known as filtering. 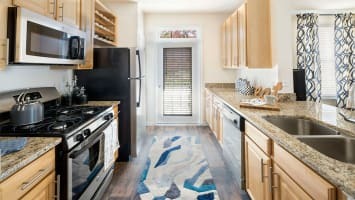 However, this process relies on a balanced supply of units of varying ages, and a lack of new construction can prevent older units from filtering down. While rent data from 2000 shows that older rental units are indeed more affordable, this has begun to change in recent years, as rents have grown fastest for the oldest cohorts of rental properties. From 2000 to 2016, the real median rent for units built from 1990 to 1999 increased by 6.5 percent, while rents in units built before 1960 increased by 21.4 percent. Subdued levels of new construction seem to have increased the demand for older units and incentivized remodeling. This has hindered the filtering process, with older properties which have historically been a source of affordability now quickly growing more expensive. In recent years, housing affordability has emerged as a key issue which increasingly affects not just low-income households, but also millions of middle class renters. The magnitude of this problem is evidenced by a bill recently proposed by Sen. Kamala Harris (D-CA) which would provide tax credits to cost-burdened renters earning up to $100,000. As cities across the U.S. debate ways to improve affordability, it is crucial to understand the important role that aging buildings play in providing a source of market rate affordable housing for those who do not qualify for subsidized options. In a healthy housing market, buildings become less desirable as they age, leading to falling rents. However, without a sufficient supply of new construction, demand will remain high for older buildings, preventing their rents from falling. Although multifamily construction has recently made a relatively strong comeback from the housing bubble collapse, we find that the share of rental units less than 10 years old is currently at an all-time low. Furthermore, we find that since 2000, median rents have been growing fastest among the oldest cohorts of rentals, a troubling sign for the millions of renters across the nation who are burdened by rising rents and stagnant wages. During the recovery from the housing bubble collapse, construction of new multifamily housing rebounded strongly, with 2017 spending coming in at 3.8 times the amount spent in the 2010 trough. While this relative boom might give the impression that the rental market is currently overflowing with a glut of brand new units, the recent spike starts to look much smaller when viewed over a longer horizon. 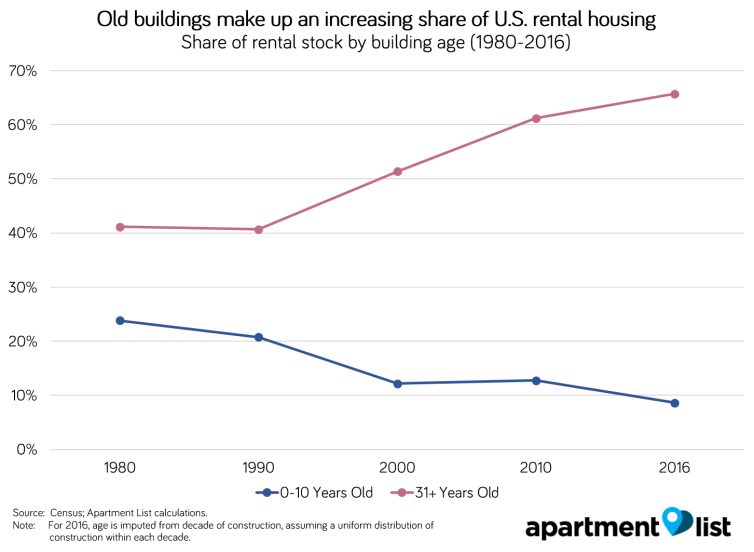 Since 1980, the share of rental units that are 10 years old or younger has been steadily declining, while the share that are over 30 years old has steadily increased.1 Furthermore, even the recent multifamily construction surge seems to be cooling off, making it unlikely that there will be a significant reversal of this trend in the near-term. As of 2016, 66 percent of rental units are more than three decades old. This is the highest share since the Census began tracking this data in 1960, and it is up from a low of 41 percent in 1980. Meanwhile, just 9 percent of the current stock of rental housing was built within the last decade, the lowest share going back to 1960 and just over one-third the level of the 1980 peak. This trend can be observed in all of the nation’s 25 largest metros, but the fastest aging is occurring in Sun Belt metros. Since 2000, the share of rental units that are over three decades old has increased by more than 20 percentage points in nine of the 25 largest metros, all located in the Sunbelt. In San Diego, for example, 40 percent of rental units were more than 30 years old in 2000, but this share had increased to 67 percent by 2016. 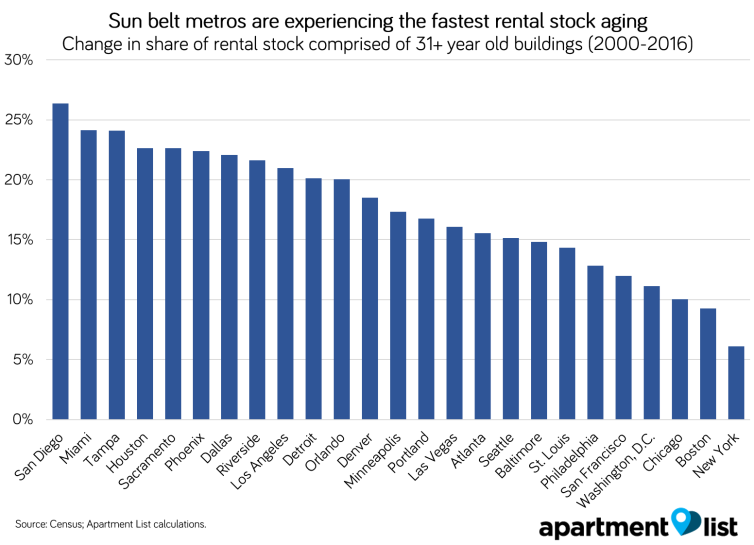 Other metros that have seen significant rental stock aging since 2000 include Miami, Houston, Phoenix and Dallas. This trend can be explained by the fact that many Sun Belt cities experienced large population booms in the 1970s and 1980s, and buildings constructed during these decades are now aging past the 30-year mark. That said, even cities with large shares of much older construction, such as Boston and Chicago, saw relative booms in rental construction during these decades. Nationally, the 1970s and 1980s are the largest cohorts of rental housing, with buildings constructed in those two decades accounting for nearly one-third of the current rental housing stock.2 The fate of these buildings as they continue to age will have important implications for our nation’s renters. A healthy supply of aging buildings plays a crucial role in ensuring that cities and neighborhoods thrive. This idea goes back to the urban theorist Jane Jacobs, who devoted a whole chapter to the topic in her influential 1961 book The Death and Life of Great American Cities. Preservationists often focus on the aesthetic and cultural value of old buildings. While these factors should not be discounted, Jacobs’ argument was not concerned with architectural landmarks, but rather with the economic value of more mundane types of older buildings. Through filtering, the luxury developments of the past eventually become today’s affordable housing. This process is consistent with the pattern seen in the chart above, which shows that in 2000, median rents were progressively lower for buildings of increasing ages. The median rent of properties built prior to 1960 was $792, compared to $1,022 for properties built in the 1990s. While this price gap may not be sufficient to make this housing attainable to the lowest earning households, older buildings play an important role in maintaining affordability for the middle class. That said, filtering is not a guaranteed outcome, as the fate of individual buildings can follow a number of trajectories. Virtually all new housing undergoes some amount of aging, but while some buildings age into affordability, others are eventually remodelled such that they command rents similar to new buildings, and some are demolished, often to make way for new construction. Furthermore, in supply-constrained markets, demand may remain high even for those old buildings which have not been remodelled, preventing these units from filtering down. While the data we analyzed does not allow us to track individual properties, inferences can be drawn by looking at rent growth within building age cohorts. We found that since 2000, rents have grown fastest among the oldest building cohorts, which tend to be the most affordable. From 2000 to 2016, the real median rent for rental units built in the 1990s grew by a relatively modest average of 6.4 percent across the nation’s 50 largest metros, as these once brand new buildings began the aging process. Over the same period, rents for units built prior to 1960 grew at over three times that rate. The quickened pace of rent growth for older building cohorts has resulted in a more narrow price gaps across buildings of different ages. In 2000, the median rent of properties built prior to 1960 was 23 percent lower than that of properties built in the 1990s. As of 2016, that gap is down to 7 percent. In short, as renter cost burdens continue to pose a major concern, the least expensive cohorts of rental housing are seeing the fastest rent growth. In many markets across the country, new housing construction has not been sufficient to meet the demand created by job growth. This shortage of new construction can be attributed to a combination of labor shortages, rising materials costs and restrictive zoning regulations, all of which make it more costly and difficult for developers to build. 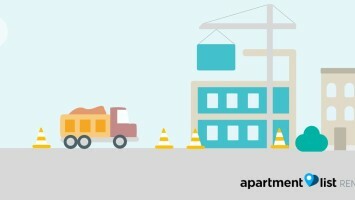 Zoning laws, in particular, often severely limit the sites on which large multifamily apartment buildings can be constructed, restricting the additions to the rental stock. A lack of new housing results in heightened demand for the existing rental stock, which leads to faster rent growth for individual units, all else equal. Furthermore, there is growing demand for central locations within metros, and older buildings tend to be disproportionately located in these central areas. 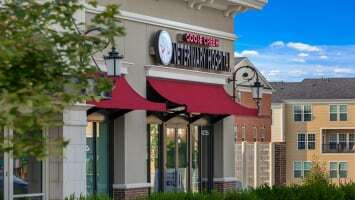 Increased demand for older buildings furthers the incentives for owners of those buildings to invest in substantial remodeling with the goal of charging increased rents. This hypothesis is in line with research from the Harvard Joint Center for Housing Studies, which found 12 percent average annual growth in per-unit investments in professionally-managed rental properties from 2010 to 2015. The trend of faster rent growth within older building cohorts is particularly notable as the largest cohorts of rental units are now more than three decades old. Affordable housing policy debates often focus on the need for increases in subsidized housing. This need is real, underscored by the fact that subsidized housing serves only a small fraction of the low-income households who qualify for it. That said, housing affordability is an issue that also affects millions of middle-income households who do not qualify for subsidized housing options. In 36 of the nation’s 50 largest metros, a household earning the median renter income would be cost-burdened by the median rent. An inclusive rental market necessitates not only subsidized housing, but also affordable market rate options to serve the middle class. Aged buildings can provide an important source of rental housing affordable to the middle class as these units “filter down.” However, our analysis shows that rents in buildings over 50 years years old have been growing quickly as the relatively low rate of recent construction incentivizes the remodeling and redevelopment of these units. This trend implies that the large 1970s and 1980s cohorts of rental housing are poised to see rapid rent growth in the coming years, while the following cohorts are notably smaller. Removal of zoning barriers – Local zoning ordinance represent a significant hurdle that hinder the market from supplying new housing. Significant overhaul of these laws is an uphill political battle, but proposals such as the failed California housing bill SB 827 show that politicians are beginning to get more creative with their approaches to zoning. Affordable by design – While the traditional filtering model assumes that most new housing serves the high end of the market and gets more affordable over time, an alternative solution involves finding ways to build new market rate housing that is more affordable. This can involve designing smaller and more efficient units, using technology such as modular construction to drive down construction costs or exploring more flexible living arrangements, such as shared housing. Increased subsidies – Sen. Kamala Harris (D-CA) recently unveiled an ambitious piece of legislation that would provide tax credits to cost-burdened renters earning up to $100,000. While the idea of a renter tax credit which expands benefits to the middle class has the potential to provide relief for many families, it does not address the problem of housing supply. As our nation’s housing stock continues to age, it will grow increasingly expensive to maintain, making it more likely that these buildings will be redeveloped or remodeled out of affordability. As housing costs in some parts of the country grow increasingly unbearable, there is already evidence of households beginning to sort across locations, with middle- and lower-income households moving away from the most expensive parts of the country. While a long-distance move may help some households find more affordable housing, this shift threatens the inclusivity of many cities’ rental markets, contributing to our current state of increasing polarization. As millions struggle to pay their rent, we need creative solutions to expand the supply of affordable housing options. Figures represent all rental units, including both multifamily and single-family rentals. Interestingly, construction dates for owner-occupied units follow a markedly different distribution, with units constructed from 2000-2009 comprising the largest share of the owned housing stock. Academic research suggests that the Tax Reform Act of 1986 disincentivized construction of multifamily rental housing, one possible explanation for the the lower shares of rental housing constructed after the 1980s. The same general principle applies to commercial rents, though this is outside the scope of this report. As a cohort of buildings ages, some share will eventually be demolished. Since these older buildings tend to be of lower quality, their removal from the cohort has the effect of increasing the median rent within the cohort. This effect is known as survivorship bias. Relatedly, a portion of the single-family housing stock has transitioned from owner-occupied to renter-occupied in recent years, another compositional change that impacts the observed growth in median rents within cohorts. These effects are difficult to tease out in the aggregated data we analyzed. This is consistent with academic literature which has shown that filtering rates vary inversely with home price appreciation.